One of the questions that I am frequently asked is how do I find the time to do some cross stitch? With 3 kids it is not always easy, but one technique that I have found to work over the years is to always keep my needle threaded and ready to go. When I finish stitching for the night, I will reload my needle with the thread that I am using or need to use for the next section. If it is then possible, I will anchor the thread and then bring up the needle and thread at the spot where I want to keep working. The needle is then anchored in the first cm of fabric from the edge. By anchoring the needle there, if I do not get back to this project for a while (I am a serial starter and slow finisher), any rust that forms will only affect the part that will be hidden by the finishing technique. When I next come to this project, I may not have a lot of time, but I can usually finish off one length of thread and get the next ready for another day. 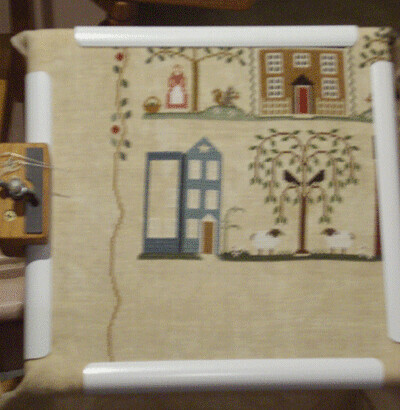 This is the most up recent picture of the sampler I am currently working on, Little House Neighborhood. That you always have a thread ready I knew and I saw… (remember, those days we saw each other weekly…) But I have never thought about where to put my needle, so thank you for that part of the tip. Great tip 🙂 I usually finish for the night & leave the needle unthreaded – might have to try re-threading it for the next day.